Wiss 5'' Electrician Scissors feature a double stripping notch for 19 gauge (0.035) and 23 gauge (0.022) wire, and is serrated along entire bottom blade with a scraper and file on back edge of blade. 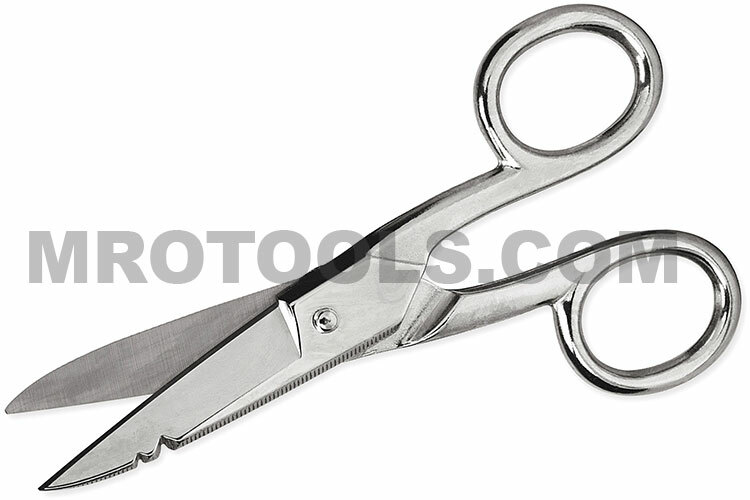 Wiss Electrician scissors are made of fully nickel-plated hot drop-forged solid steel. The 175E5 Wiss 5'' Electrician Scissors is one of thousands of quality tooling products available from MRO Tools. 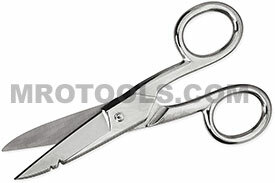 Please browse Wiss Scissors and Shears for tools similar to the 175E5 Wiss 5'' Electrician Scissors. 175E5 Wiss 5'' Electrician Scissors description summary: Wiss 5'' electrician scissors feature a double stripping notch for 19 gauge (0.035) and 23 gauge (0.022) wire, and is serrated along entire bottom blade with a scraper and file on back edge of blade. Wiss electrician scissors are made of fully nickel. Quantity discounts may be available for the 175E5 Wiss 5'' Electrician Scissors. Please contact MRO Tools for details.